Compared to deep brain electrical stimulation, which has been applied to treating pathological brain diseases, little work has been done on the effect of deep brain light stimulation. A fiber-coupled laser stimulator at 840 nm wavelength and 130 Hz pulse repetition rate is developed in this work for deep brain light stimulation in a rat model. Concentration changes in glutamate and dopamine in the striatum are observed using a microdialysis probe when the subthalamic nucleus (STN) is stimulated at various optical power levels. Experimental results show that light stimulation causes the concentration of glutamate to decrease while that of dopamine is increased. This suggests that deep brain light stimulation of the STN is a promising therapeutic strategy for dopamine-related diseases such as Parkinson’s disease. The stimulator developed for this work is useful for deep brain light stimulation in biomedical research. F. F. A. Sousa, R. A. C. Andraus, C. H. Barbieri, and N. Mazzer, “Influence of laser radiation in nerve regeneration in different treatment sites,” Acta Ortop. Bras. 17(6), 331–335 (2009). S. Rochkind, D. El-Ani, Z. Nevo, and A. Shahar, “Increase of neuronal sprouting and migration using 780 nm laser phototherapy as procedure for cell therapy,” Lasers Surg. Med. 41(4), 277–281 (2009). G. M. Dittami, S. M. Rajguru, R. A. Lasher, R. W. Hitchcock, and R. D. Rabbitt, “Intracellular calcium transients evoked by pulsed infrared radiation in neonatal cardiomyocytes,” J. Physiol. 589(6), 1295–1306 (2011). W.-K. Ong, H.-F. Chen, C.-T. Tsai, Y.-J. Fu, Y.-S. Wong, D.-J. Yen, T.-H. Chang, H.-D. Huang, O. K. Lee, S. Chien, and J. H. Ho, “The activation of directional stem cell motility by green light-emitting diode irradiation,” Biomaterials 34(8), 1911–1920 (2013). J. T. Hashmi, Y. Y. Huang, B. Z. Osmani, S. K. Sharma, M. A. Naeser, and M. R. Hamblin, “Role of low-level laser therapy in neurorehabilitation,” Am. Acad. Phys. Med. Rehabilitation 2(12Suppl 2), S292–S305 (2010). A. Oron, U. Oron, J. Streeter, L. de Taboada, A. Alexandrovich, V. Trembovler, and E. Shohami, “Low-level laser therapy applied transcranially to mice following traumatic brain injury significantly reduces long-term neurological deficits,” J. Neurotrauma 24(4), 651–656 (2007). Y. Lampl, J. 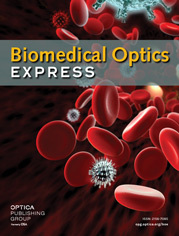 A. Zivin, M. Fisher, R. Lew, L. Welin, B. Dahlof, P. Borenstein, B. Andersson, J. Perez, C. Caparo, S. Ilic, and U. Oron, “Infrared laser therapy for ischemic stroke: a new treatment strategy: results of the NeuroThera Effectiveness and Safety Trial-1 (NEST-1),” Stroke 38(6), 1843–1849 (2007). Y. Y. Huang, A. C. Chen, J. D. Carroll, and M. R. Hamblin, “Biphasic dose response in low level light therapy,” Dose Response 7(4), 358–383 (2009). J. Tafur and P. J. Mills, “Low-intensity light therapy: exploring the role of redox mechanisms,” Photomed. Laser Surg. 26(4), 323–328 (2008). B. Drukarch, C. A. M. Jongenelen, E. Schepens, C. H. Langeveld, and J. C. Stoof, “Glutathione is involved in the granular storage of dopamine in rat PC 12 pheochromocytoma cells: implications for the pathogenesis of Parkinson’s disease,” J. Neurosci. 16(19), 6038–6045 (1996). A. Schrag, M. Jahanshahi, and N. Quinn, “What contributes to quality of life in patients with Parkinson’s disease?” J. Neurol. Neurosurg. Psychiatry 69(3), 308–312 (2000). J. T. Ting and G. Feng, “Glutamatergic synaptic dysfunction and obsessive-compulsive disorder,” Curr Chem Genomics 2, 62–75 (2008). K. W. Lange, J. Kornhuber, and P. Riederer, “Dopamine/glutamate interactions in Parkinson’s disease,” Neurosci. Biobehav. Rev. 21(4), 393–400 (1997). O. Rascol, D. J. Brooks, A. D. Korczyn, P. P. De Deyn, C. E. Clarke, and A. E. Lang, “A five-year study of the incidence of dyskinesia in patients with early Parkinson’s disease who were treated with ropinirole or levodopa. 056 Study Group,” N. Engl. J. Med. 342(20), 1484–1491 (2000). P. A. LeWitt, “Levodopa for the treatment of Parkinson’s Disease,” N. Engl. J. Med. 359(23), 2468–2476 (2008). C. G. Goetz, W. Poewe, O. Rascol, and C. Sampaio, “Evidence-based medical review update: pharmacological and surgical treatments of Parkinson’s disease: 2001 to 2004,” Mov. Disord. 20(5), 523–539 (2005). B. D. Greenberg, D. A. Malone, G. M. Friehs, A. R. Rezai, C. S. Kubu, P. F. Malloy, S. P. Salloway, M. S. Okun, W. K. Goodman, and S. A. Rasmussen, “Three-year outcomes in deep brain stimulation for highly resistant obsessive-compulsive disorder,” Neuropsychopharmacology 31(11), 2384–2393 (2006). B. J. Nuttin, L. A. Gabriëls, P. R. Cosyns, B. A. Meyerson, S. Andréewitch, S. G. Sunaert, A. F. Maes, P. J. Dupont, J. M. Gybels, F. Gielen, and H. G. Demeulemeester, “Long-term electrical capsular stimulation in patients with obsessive-compulsive disorder,” Neurosurgery 62(6Suppl 3), 966–977 (2008). P. Limousin, P. Krack, P. Pollak, A. Benazzouz, C. Ardouin, D. Hoffmann, and A.-L. Benabid, “Electrical stimulation of the subthalamic nucleus in advanced Parkinson’s disease,” N. Engl. J. Med. 339(16), 1105–1111 (1998). J. H. Pazo, C. Höcht, A. C. Barceló, B. Fillipini, and M. J. Lomastro, “Effect of electrical and chemical stimulation of the subthalamic nucleus on the release of striatal dopamine,” Synapse 64(12), 905–915 (2010). Y. M. Shon, K. H. Lee, S. J. Goerss, I. Y. Kim, C. Kimble, J. J. Van Gompel, K. Bennet, C. D. Blaha, and S. Y. Chang, “High frequency stimulation of the subthalamic nucleus evokes striatal dopamine release in a large animal model of human DBS neurosurgery,” Neurosci. Lett. 475(3), 136–140 (2010). L. Mallet, M. Polosan, N. Jaafari, N. Baup, M. L. Welter, D. Fontaine, S. T. du Montcel, J. Yelnik, I. Chéreau, C. Arbus, S. Raoul, B. Aouizerate, P. Damier, S. Chabardès, V. Czernecki, C. Ardouin, M. O. Krebs, E. Bardinet, P. Chaynes, P. Burbaud, P. Cornu, P. Derost, T. Bougerol, B. Bataille, V. Mattei, D. Dormont, B. Devaux, M. Vérin, J. L. Houeto, P. Pollak, A. L. Benabid, Y. Agid, P. Krack, B. Millet, and A. Pelissolo,“Subthalamic nucleus stimulation in severe obsessive-compulsive disorder,” N. Engl. J. Med. 359(20), 2121–2134 (2008). B. K. Yamamoto and S. Davy, “Dopaminergic modulation of glutamate release in striatum as measured by microdialysis,” J. Neurochem. 58(5), 1736–1742 (1992). A. Abdo and M. Sahin, “NIR light penetration depth in the rat peripheral nerve and brain cortex,” in Proceedings of IEEE Conference on Engineering in Medicine and Biology Society (IEEE, 2007), pp. 1723–1725. A. Gangi, H. Alizadeh, L. Wong, X. Buy, J.-L. Dietemann, and C. Roy, “Osteoid osteoma: percutaneous laser ablation and follow-up in 114 patients,” Radiology 242(1), 293–301 (2007). Fig. 1 (a) Schematic of deep brain laser-light stimulator. (b) Overall external appearance of the system. Fig. 2 Optical spectrum of the light stimulator showing 840 nm peak wavelength. Fig. 3 (a) Periodic structure of the optical chopper. (b) Temporal waveforms of the amplitude-modulated laser light at three modulation frequencies of 0 Hz (black), 50 Hz (red), and 130 Hz (blue). Note that a modulation frequency of 0 Hz yields the unmodulated CW output. Fig. 4 (a) Schematic top view of the rat brain. A rat is fixed on a stereotactic apparatus, which is used to accurately locate the stimulus fiber in the targeted STN and the microdialysis probe in the striatum. (b) Flow diagram of the experimental protocol.